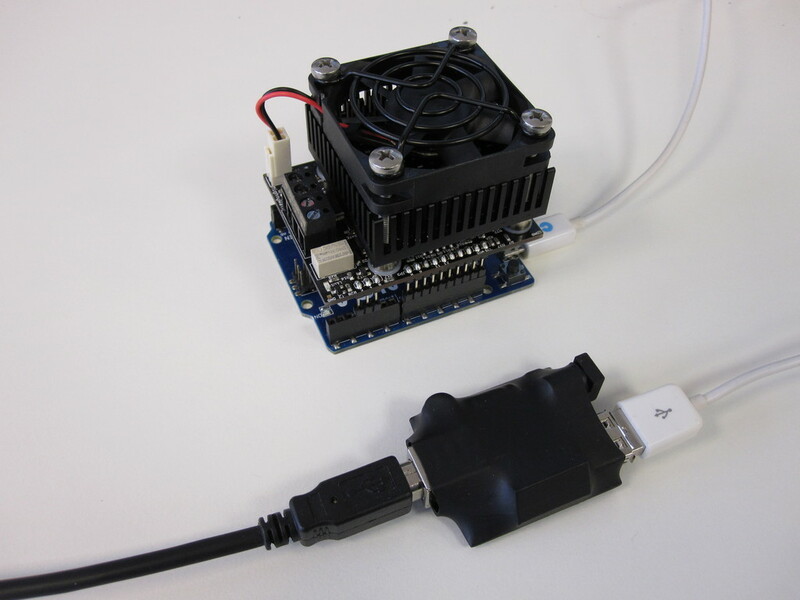 Barebox is an open source bootloader intended for embedded systems. In the past few weeks I've been spending a lot of time at work polishing its support for Raspberry Pi boards and fixing some rough edges. Some of my patches have already been merged upstream, and I'm hoping the remainder will end up in one the of upcoming releases. I thought I might as well write a short tutorial on how to get it running on a Raspberry Pi 3 with the stock Raspbian Linux distribution. The Broadcom BCM28xx SoC on Raspberry Pi has a peculiar boot process. First a proprietary binary blob is started on the VideoCore processor. This firmware reads some config files and does some hardware initialization. Finally, it brings up the ARM core, loads a kernel image (or a bootloader, as we'll see later) and jumps to it. When starting the kernel it also passes to it some hardware information, such as a device tree and boot arguments. Raspbian Linux ships with its own patched Linux kernel that tends to be relatively tightly coupled with the VideoCore firmware and the information it provides. On the other hand, upstream Linux kernels tend to ignore the VideoCore as much as possible. This makes them much easier to use with a bootloader. In fact, a bootloader is required since they can't use the device tree provided by the VideoCore firmware. Unfortunately, upstream kernels also historically have worse support for various peripherals found on Raspberry Pi boards, so sometimes you can't use them. In the rest of this text, I'll be only talking about Raspbian kernels as most of my work focused on making the VideoCore interoperation work correctly for them. To get started, you'll need a Raspberry Pi 3 board and an SD card with a Raspbian Stretch Lite. You'll also need a USB-to-serial adapter that uses 3.3V levels (I'm using this one) and another computer to connect it to. 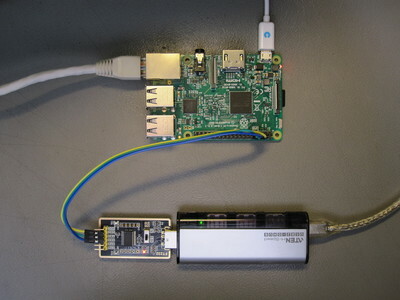 Connect ground, pin 14 and pin 15 on Raspberry Pi header to ground, RXD and TXD on the serial adapter respectively. We will use this connection to access the Barebox serial console. For the parts where we will interact with the Linux system on the Raspberry Pi you can also connect it to a HDMI monitor and a keyboard. I prefer to work over ssh. It's possible to cross-compile Barebox for ARM on an Intel computer. However, for simplicity we'll just compile Barebox on the Raspberry Pi itself since all the tools are already available there. If you intend to experiment, it's worth setting up either the cross-compiler or two Raspberry Pis: one for compilation and one for testing. Update: Barebox v2019.04.0 release should contain everything shown in this blog post. This should take around a minute on a Raspberry Pi 3. If compilation fails, check if you are missing any tools and install them. You might need to install flex and bison with apt-get. Maybe you have to create the partition. Press a key to drop into the Hush shell. You'll get a prompt that is very similar to Bash. You can use cd to move around and ls to inspect the filesystem. Barebox uses the concept of filesystem mounts just like Linux. By default, the boot partition on the SD card gets mounted under /boot. The root is a virtual RAM-only filesystem that is not persistent. The shell supports simple scripting with local and global variables. Barebox calls the shell scripts that get executed on boot the bootloader environment. You can find those under /env. The default environment on Raspberry Pi currently doesn't do much, so if you intend to use Barebox in some application, you will need to do the scripting yourself. barebox@RaspberryPi Model 3B:/ global linux.bootargs.vc="$global.vc.bootargs"
The global command adds the kernel command-line from VideoCore to the final kernel boot arguments. Barebox saves the command-line that was passed to it from the firmware into the vc.bootargs variable. When booting the kernel, Barebox constructs the final boot arguments by concatenating all global variables that start with linux.bootargs. The bootm command actually boots the ARMv7 kernel (/boot/kernel7.img) from the SD card using the device tree from the VideoCore. Each time it is started, Barebox saves the VideoCore device tree to its own root filesystem at /vc.dtb. A few moments after issuing the bootm command, the Raspbian system should come up and you should be able to log into it. Depending on whether the serial console has been enabled in the Linux kernel, you might also see kernel boot messages and a log-in prompt in the serial terminal. Since we passed both the VideoCore device tree contents and the command-line to the kernel, the system should work as if no bootloader was actually used. This means that settings in cmdline.txt and config.txt, such as device tree overlays and HDMI configuration, should be correctly honored. In the end, why would you want to use such a bootloader? Increasing reliability and resistance to bad system updates is one reason. For example, Barebox can enable the BCM28xx hardware watchdog early in the boot process. This means that booting a bad kernel is less likely to result in a system that needs a manual reset. A related Barebox feature is the bootchooser which can be used to implement the A/B root partition scheme, so that a failed boot from one root automatically results in the bootloader falling back to the other root. Note however that one thing still missing in Barebox is the support for reading reset-source on Raspberry Pi, so you can't yet distinguish between a power-on reset and a watchdog running out. As it was pointed out on the Barebox mailing list, this is not perfect. Discussion on the design of the hardware watchdog aside, the bootloader also can't help with VideoCore firmware updates, since the firmware gets started before the bootloader. Also since the device tree and kernel in Raspbian are coupled with the VideoCore firmware, this means that kernel updates in Raspbian can be problematic as well, even with a bootchooser setup. However a step towards a more reliable system, even if not perfect, can still solve some real-life problems. Wacom Cintiq 16 (DTK-1660/K0-BX) is a drawing tablet that was announced late last year. At around 600€ I believe it's now the cheapest tablet with a display you can buy from Wacom. For a while I've been curious about these things, but the professional Wacoms were just way too expensive and I wasn't convinced by the cheaper Chinese alternatives. 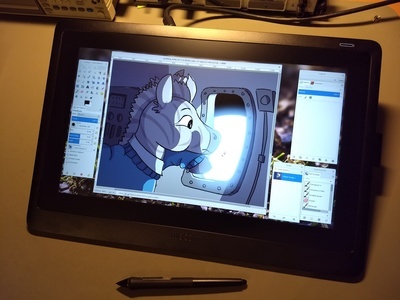 I've been using a small Intuos tablet for several years now and Linux support has been flawless from the start. So when I recently saw the Cintiq 16 on sale at a local reseller and heard there are chances that it will work similarly well on Linux I couldn't resist buying one. Even though it's a very recent device, the Linux kernel already includes a compatible driver. Regardless, I was prepared for some hacking before it was usable on Debian. I was surprised how little was actually required. 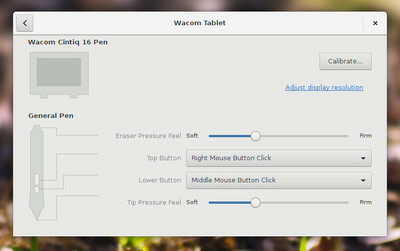 As before, the Linux Wacom Project is doing an amazing job, even though Linux support is not officially acknowledged by Wacom as far as I know. The tablet connects to the computer using two cables: HDMI and USB. HDMI connection behaves just like a normal 1920x1080 60 Hz flat panel monitor and the display works even if support for everything else is missing on the computer side. The HDMI cable also caries an I2C connection that can be used to adjust settings that you would otherwise expect in a menu accessible by buttons on the side of a monitor (aside from a power button, the Cintiq itself doesn't have any buttons). usb 1-6: Manufacturer: Wacom Co., Ltd.
usb 1-6.1: Manufacturer: Wacom Co.,Ltd. 056a:0395 is the hub and 056a:0390 is the Human Interface Device class device that provides the actual pen input. When the tablet is off but connected to power, the HID disconnects but other two USB devices are still present on the bus. I'm not sure what the UART is for. This thread on GitHub suggests that it offers an alternative way of interfacing with the I2C bus for adjusting the display settings. On the stock 4.9.130 kernel that comes with Stretch the pen input wasn't working. However, the 4.19.12 kernel from stretch-backports correctly recognizes the devices and as far as I can see works perfectly. I'm using the stock GNOME 3.22 desktop that comes with Stretch. After upgrading the kernel, the tablet correctly showed up in the Wacom Tablet panel in gnome-control-center. Pen settings there also work and I was able to calibrate the input using the Calibrate button. Calibration procedure instructs you to press the pen onto targets shown on the display and looks exactly like when using official software on Mac OS. Update: It seems that GNOME sometimes messes up the tablet-to-screen mapping. If the stylus suddenly starts to move the cursor on some other monitor instead of displaying it underneath the stylus on the Wacom display, check the key /org/gnome/desktop/peripherals/tablets/056a:0390/display in dconf-editor. 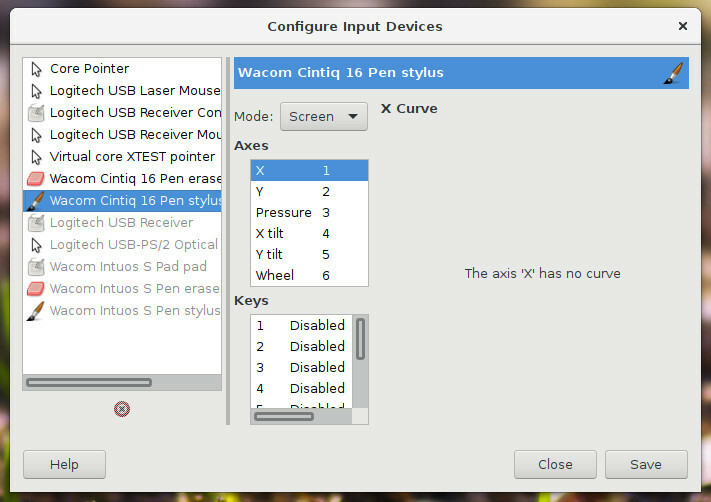 It should contain something like ['WAC', 'Cintiq 16', '...']. If it doesn't, delete they key and restart gnome-settings-daemon. In GIMP I had to enable the new input devices under Edit, Input Devices and set them to Screen mode, same as with other tablets. You get two devices: one for the pen tip and another one for when you turn the pen around and use the other eraser-like end. These two behave like independent devices in GIMP, so each remembers its own tool settings. As far as I can see, pen pressure, tilt angle and the two buttons work correctly in GIMP. The only problem I had is that it's impossible to do a right-click on the canvas to open a menu. This was already unreliable on the Intuos and I suspect it has to do with the fact that the pen always moves slightly when you press the button (so GIMP registers click-and-drag rather than a click). With the higher resolution of the Cintiq it makes sense that it's even harder to hold the pen still enough. Otherwise, GIMP works mostly fine. I found GNOME to be a bit stubborn about where it wants to place new dialog windows. If I have a normal monitor connected alongside the tablet, file and color chooser dialogs often end up on the monitor instead of the tablet. Since I can't use the pen to click on something on the monitor, it forces me to reach for the mouse, which can be annoying. I've noticed that GIMP sometimes lags behind the pen, especially when dragging the canvas with the middle-click. I didn't notice this before, but I suspect it has to do with the higher pen resolution or update rate of the Cintiq. The display also has a higher resolution than my monitor, so there are more pixels to push around. In any case, my i5-750 desktop computer will soon be 10 years old and is way overdue for an upgrade. In conclusion, I'm very happy with it even if it was a quite an expensive gadget to buy for an afternoon hobby. After a few weeks I'm still getting used to drawing onto the screen and tweaking tool dynamics in GIMP. The range of pressures the pen registers feels much wider than on the Intuos, although that is probably very subjective. To my untrained eyes the display looks just amazing. 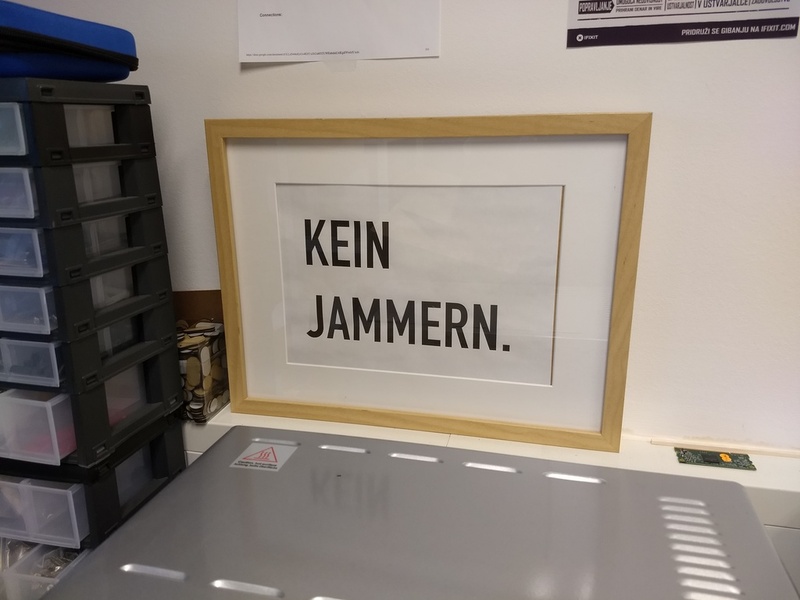 The screen is actually bigger than I thought and since it's not easily disconnectable it is forcing me to rethink how to organize my desk. 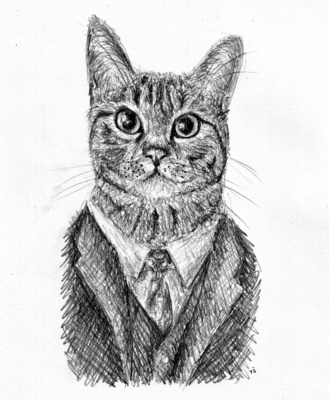 In the end however, my only worry is that my drawing skills are often not on par with owning such a powerful tool. 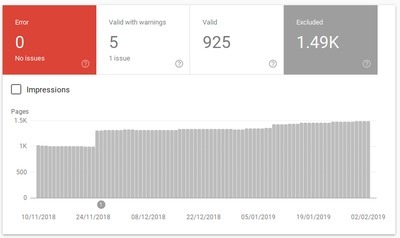 It recently came to my attention that Google has a new Search Console where you can see the status of your web site in Google's search index. I checked out what it says for this blog and I was a bit surprised. Considering that I have less than a thousand published blog posts this number seemed high. Diving into the details, it turned out that most of the excluded pages were redirects to canonical URLs and Atom feeds for post comments. 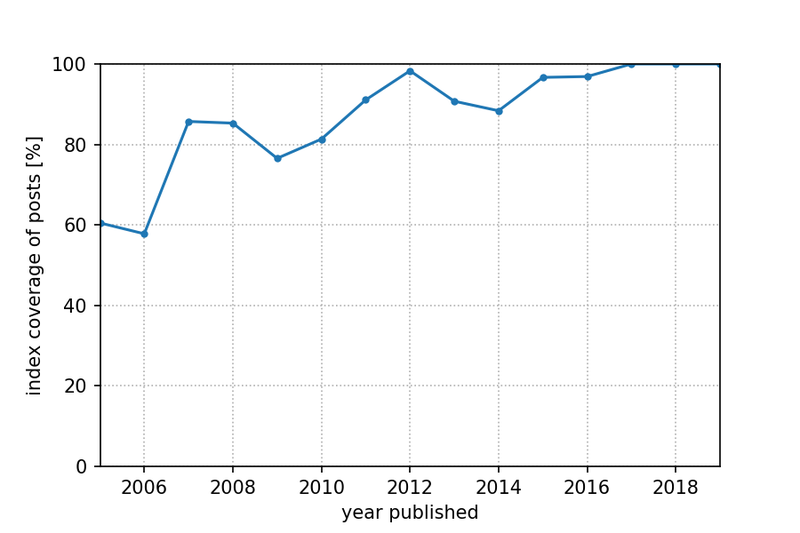 However at least 160 URL were permalink addresses of actual blog posts (there may be more, because the CSV export only contains the first 1000 URLs). I read this as "we know this page exists, there's no technical problem, but we don't consider it useful to show in search results". The older the blog post, the more likely that it was excluded. 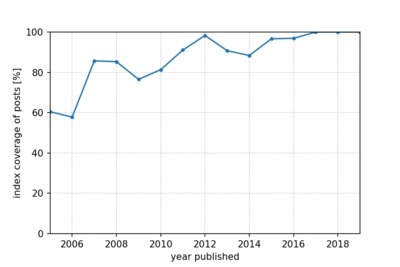 Google's index apparently contains only around 60% of my content from 2006, but 100% of that published in the last couple of years. I've tried searching for some of these excluded blog posts and indeed they don't show in the results. I have no intention to complain about my early writings not being shown to Google's users. As long as my web site complies with generally accepted technical standards I'm happy. I write about things that I find personally interesting and what I earnestly believe might be useful information in general. I don't feel entitled to be shown in Google's search results and what they include in their index or not is their own business. That said, it did made me think. I'm using Google Search almost exclusively to find information on the web. I suspected that they heavily prioritize new over old, but I've never seriously considered that Google might be intentionally excluding parts of the web from their index altogether. I often hear the sentiment how the old web is disappearing. 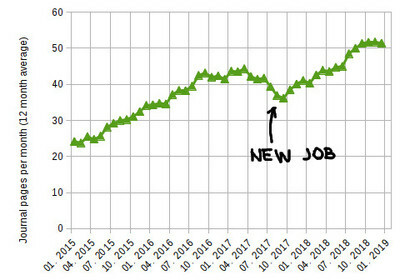 That the long tail of small websites is as good as gone. Some old one-person web sites may indeed be gone for good, but as this anecdote shows, some such content might just not be discoverable through Google. All this made me switch my default search engine in Firefox to DuckDuckGo. Granted I don't know what they include or exclude from their search either. I have yet to see how well it works, but maybe it isn't such a bad idea to go back to the time where trying several search engines for a query was a standard practice. 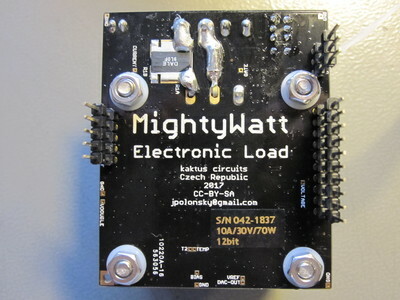 MightyWatt is a small, computer controlled electronic DC load made by Jakub Polonský. I recently ordered one for work, since I often need to test power supplies and it was significantly cheaper than a similar professional desktop instrument. I was first looking for a Re:load Pro, since I have been very happy with the old analog Re:load, however it turns out they are out of stock and impossible to get. MightyWatt was the closest alternative that fit the budget. After several months, here is a quick review and some notes on how well it performs in practical use. Compared to Re:load, MightyWatt is not a stand-alone device. It comes in the form of an Arduino shield and you need to mount it on an Arduino Uno (or a compatible) microcontroller board. You also need to compile an open source firmware yourself and program the board with it. The ATmega328 on the Arduino then controls the load and communicates with the computer you connect to its USB port. It's also worth mentioning that this design already has quite a history. First revision apparently shipped in 2014. I am using revision 3 hardware from 2017 and latest software from GitHub. During these tests I was using an Arduino-knockoff called Smduino. To protect the computer from any mishaps with the load, I'm connecting it over an Olimex USB-ISO USB isolator. The initial setup went quite smoothly. The instructions on how to program the firmware using the Arduino IDE were nice and clear. After your order, the author commits the calibration file for your serial number to GitHub, which I thought was a nice approach. The control program for Windows has a pre-compiled build in the GitHub repo, so there is no need to install Visual Studio, unless you want to compile it from the C# source yourself. In contrast to the straightforward software instructions I could find no illustration showing how to actually mount the device onto the Arduino board and initially I was a bit baffled. The 100 mil male headers on the MightyWatt are missing pins from the standard Arduino shield layout, so it's possible to fit them into the sockets in several possible ways. I'm guessing only one of those doesn't end in disaster. In the end I noticed the (very) tiny pin markings on the MightyWatt silk-screen and matched them with the corresponding pins on the Arduino. Unfortunately, the headers are also the only thing that keeps MightyWatt mechanically connected to the Arduino. Beefy measurement cables are commonplace when working with large currents and the stiffness of the headers alone just isn't enough to keep the MightyWatt securely connected to the Arduino. On several occasions I found that I have pulled it off when messing with the cabling. I was looking into 3D-printing an enclosure, however this MightyWatt PCB doesn't have any spare holes for additional screws, so it's not easy to work around this issue. It seems that an acrylic case existed at one point, but I couldn't find it for sale and since it doesn't seem to screw onto the PCB I'm not sure it would help. 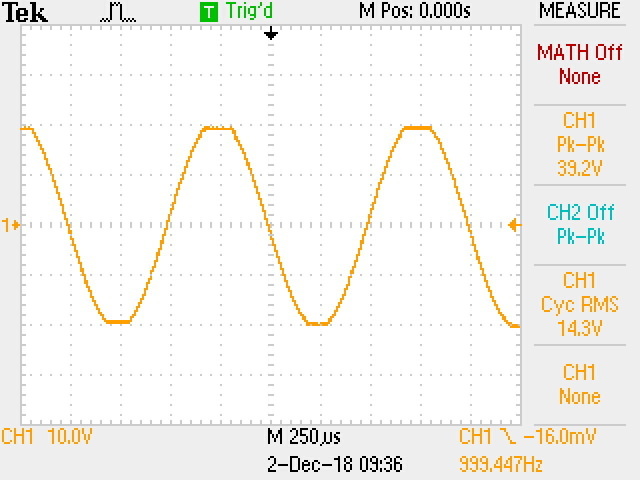 Comparing MightyWatt current readout to VC220. VC220 was in series with MightyWatt current terminals. 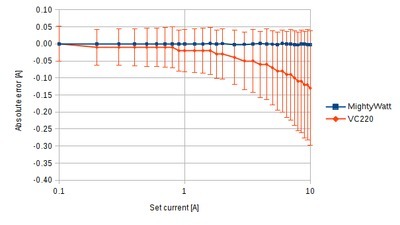 The load was in constant current mode and was connected to a 5 V power supply. 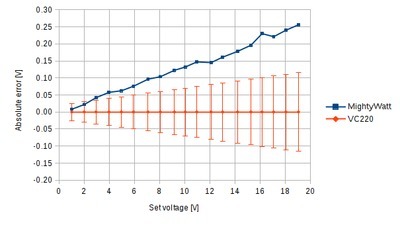 Comparing MightyWatt voltage readout to VC220. The load was in 4-point mode with a lab power supply connected to the voltage terminals. Current terminals were not connected. As far as accuracy and calibration is concerned, I can't be certain since I don't have any good reference to compare it to. 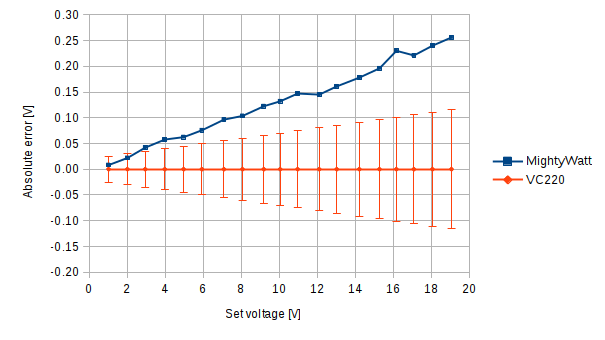 After some simple experiments with a VC220 multimeter it seems reasonable, as you can see on the graphs above. The current readout on the MightyWatt is with-in the measurement tolerance of the VC220 for the complete 10 A range. 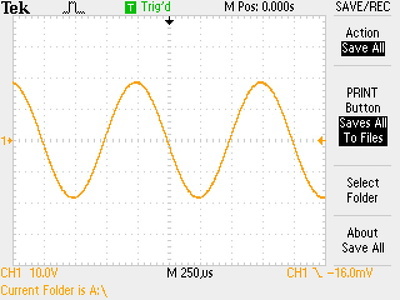 Voltage readout does fall outside of the tolerance of VC220. 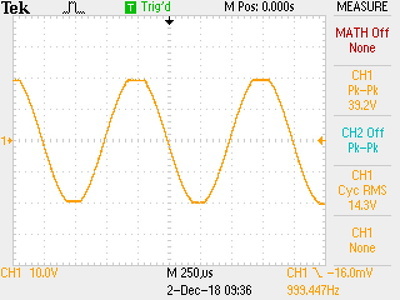 I don't know whether that is a fault of VC220 or MightyWatt, but in any case, both devices only disagree for about 1% and linearity looks good. 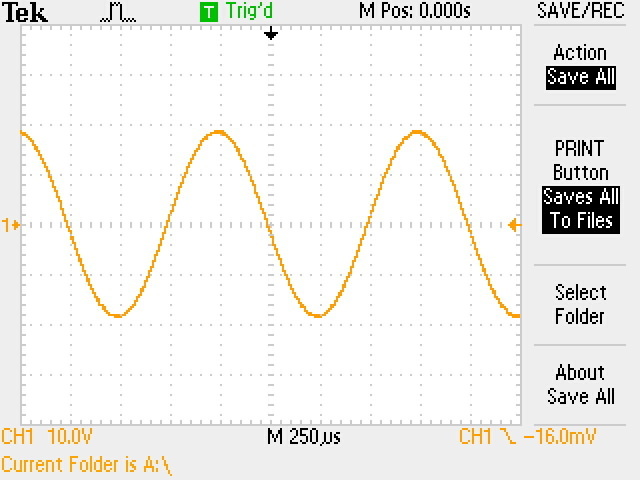 One problem I noticed with constant current setting was that there seems to be a momentary glitch when changing the set point with the load running (i.e. without stopping it). 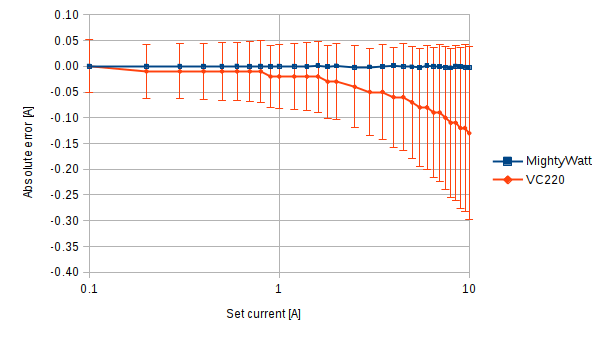 This seems to trigger some fast over-current protections, even when currents should be well below the limit. For example, changing the load from 1 A to 2 A sometimes puts a 3 A supply into foldback mode, but doing the same by stopping the load for the change doesn't. I really like the fact that MightyWatt supports 4-point Kelvin measurements. The software also supports a mode called Simple ammeter, which puts current inputs into minimum resistance. Combined with the 4-point setting, this converts MightyWatt into a computer-controlled ampere- and voltmeter pair. I have not tried this mode yet, but it sounds like it might be useful as a simple power meter. Other than that, I haven't looked much into the electronics design. However the author has a blog with many interesting posts on the design of the MightyWatt if you are interested in the details. The Windows software is functional, if somewhat buggy at times. 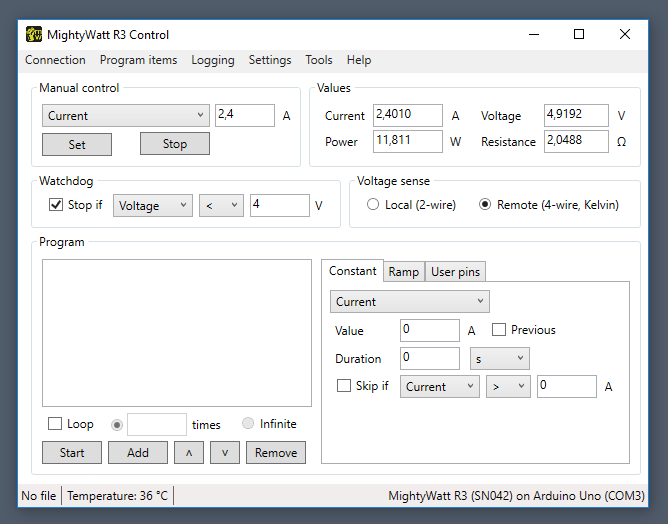 Unfortunately as far as I can see, there is no way to control MightyWatt from Linux at the moment. I would love to automate my measurements with Python, like I've been doing with everything else. Fortunately, the Windows control program allows you do some simple scripting, so that is not that much of a pain. Also, the communications protocol seems well documented and I just might write a Python library for it eventually. My biggest issue with the software is that the Windows control program seems to often lose connection with the load. This isn't handled gracefully and I often find that it will no longer see the MightyWatt's COM port after that. This then requires some ritual of reconnecting the USB cable and restarting the application to get it working again. I'm not sure what is the reason for this and I don't know whether this is a software problem on Windows side or whether the Arduino firmware is crashing. 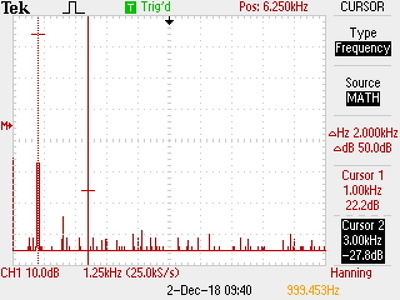 First I was blaming electrical interference, since it appeared to often happen when I connected an oscilloscope probe to a supply I was testing. Then I thought the USB isolator was causing it. 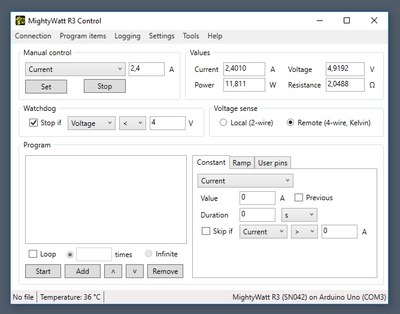 However after some more testing I found that this still randomly happens even if I just let the MightyWatt run idle, directly connected with a USB cable to a PC. In conclusion, it's a nice little instrument for its price, especially considering that similar instruments can easily cost an order of a magnitude more. I like that it comes tested and calibrated out of the box and that it's well documented. I really like the open source aspect of it and I always find it hard to criticize such projects without submitting patches. The Windows control software is pretty powerful and can support a lot of different measurements. The ugly part is the flimsy mechanical setup and the connection reliability problem, which means that I can't leave a measurement running without being constantly present to check for errors. Just a quick note that I've managed to get a ticket for this year's Chaos Communications Congress. So I'll be in Leipzig at the end of the month, in case anyone wants to have a chat. I don't have anything specific planned yet. I haven't been at the congress since 2015 and I don't know how much has changed in the past years since it moved from Hamburg. I've selected some interesting talks on Halfnarp, but I have a tentative plan to spend more time talking with people than camping in the lecture halls. Drop me an email or possibly tweet to @avian2 if you want to meet. 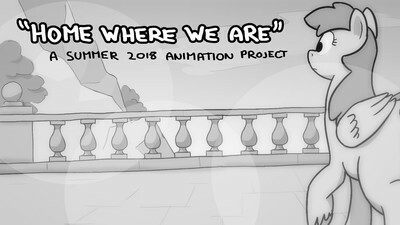 This summer I made a 60-second hand-drawn animation using GIMP and Kdenlive. I thought I might write down some notes about the process I used and the software problems I had to work around. Perhaps someone else considering a similar endeavor will find them useful. For sake of completion, the hardware I used for image and video editing was a Debian GNU/Linux system with 8 GB of RAM and an old quad-core i5 750 CPU. For drawing I used a 7" Wacom Intuos tablet. 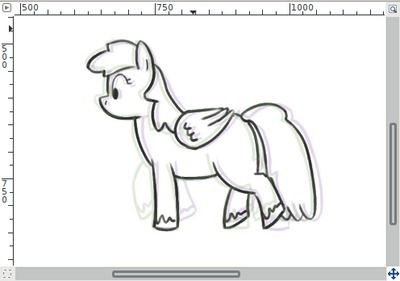 For some rough sketches I also used an old iPad Air 2 with Animation Creator HD and a cheap rubber finger-type stylus. Animation Creator was the only proprietary software I used. I drew all the final animation cels in GIMP 2.8.18, as packaged in Debian Stretch. I've used my Onion Layers plug-in extensively and added several enhancements to it as work progressed: It now has the option to slightly color tint next and previous frames to emphasize in which direction outlines are moving. I also added new shortcuts for adding a layer to all frames and adding a new frame. I found that GIMP will quite happily work with images with several hundreds of layers in 1080p resolution and in general I didn't encounter any big problems with it. 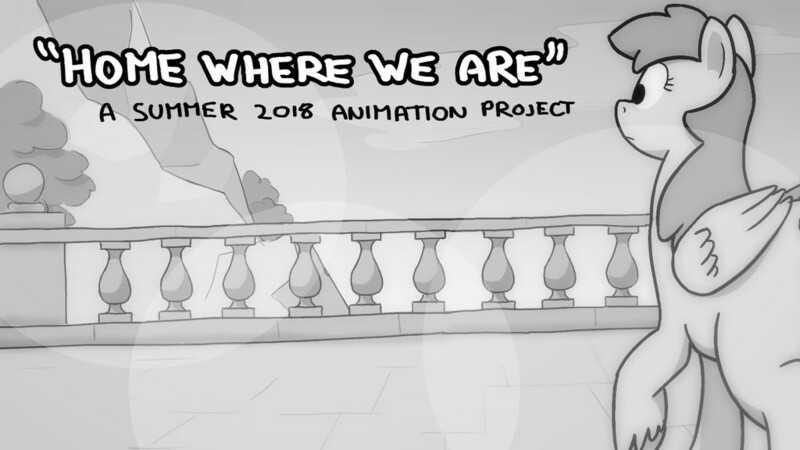 The only thing I missed was an easier way to preview the animation with proper timings, although flipping through frames by hand using keyboard shortcuts worked quite well. For some of the trickier sequences I used the iPad to draw initial sketches. The rubber stylus was much too imprecise to do final outlines with it, but I found drawing directly on the screen more convenient for experimenting. I later imported those sketches into GIMP using my Animation Creator import plug-in and then drew over them. A cel naively colored using Bucket Fill (left), manually using the Paintbrush Tool (middle) and using the Color Layer plug-in (right). I've experimented quite a bit with how to efficiently color-in the finished outlines. Normal Bucket Fill leaves transparent pixels if used on soft anti-aliased outlines. The advice I got was to color the outlines manually with a Paintbrush Tool, but I found that much too time consuming. In the end I made a quick-and-ugly plug-in that helped automate the process somewhat. It used thresholding to create a sharp outline on a layer beneath the original outline. I then used Bucket Fill on that layer. This preserved somewhat the the quality of the initial outline. 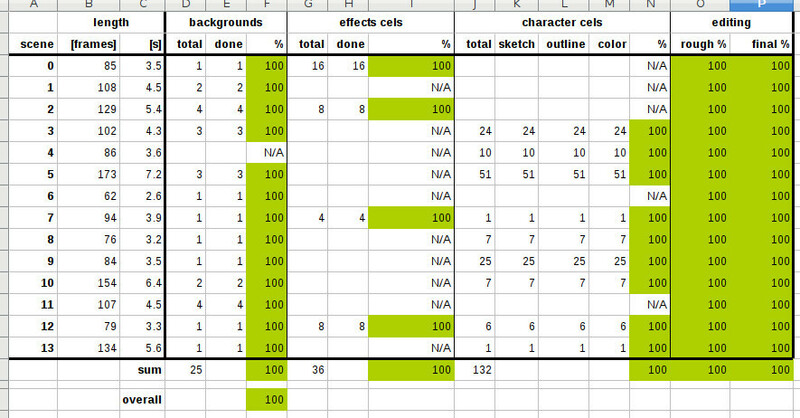 I mostly used one GIMP XCF file per scene for cels and one file for the backgrounds (some scenes had multiple planes of backgrounds for parallax scrolling). I exported individual cels using the Export Layers into transparent-background PNG files. For the scene where I had two characters I later wished that I had one XCF file per character since that would make it easier to adjust timing. I imported the background and cels into Kdenlive. Backgrounds were simple static Image Clips. For cels I mostly used Slideshow Clips with a small frame duration (e.g. 3 frame duration for 8 frames per second). For some scenes I instead imported individual cels separately as images and dragged them manually to the timeline if I wanted to adjust timing of individual cels. That was quite time consuming. The cels and backgrounds were composited using a large number of Composite & Transform transitions. I was first using Kdenlive 16.12.2 as packaged by Debian but later found it too unstable. I switched to using the 18.04.1 AppImage release from the Kdenlive website. Switching versions was painful, since the project file didn't import properly in the newer version. Most transitions were wrong, so I had to redo much of the editing process. I initially wanted to do everything in one monolithic Kdenlive project. However this proved to be increasingly inconvenient as work progressed. Even 18.04.1 was getting unstable with a huge number of clips and tracks on the timeline. 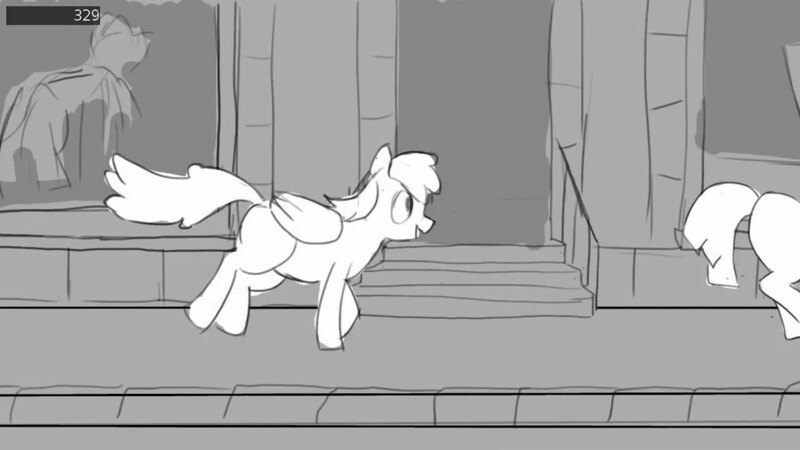 I also was having trouble properly doing nice-looking dissolves between scenes that involved multiple tracks. Sometimes seemingly independent Composite & Transforms were affecting each other in unpredictable ways. So in the end I mostly ended up with one Kdenlive project per scene. I rendered each such scene to a lossless H.264 and then imported the rendered scenes into a master Kdenlive project for final editing. 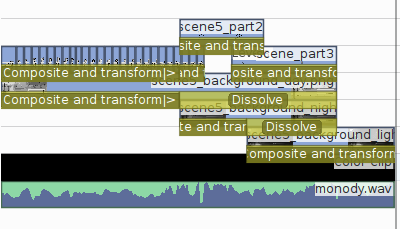 Regarding Kdenlive stability, I had the feeling that it doesn't like Color Clips for some reason, or transitions to blank tracks. I'm not sure if there's really some bug or it was just my imagination (I couldn't reliably reproduce any crash that I encountered), but it seemed that the frequency of crashes went down significantly when I put one track with an all-black PNG at the bottom of my projects. In general, the largest problem I had with Kdenlive was an issue with scaling. My Kdenlive project was 720p, but all my cels and backgrounds were in 1080p. It appeared that sometimes Composite & Transform would use 720p screen coordinates and sometimes 1080p coordinates in unpredictable ways. I think that the renderer implicitly scales down the bottom-most track to the project size, if at some point in time it sees a frame larger than the project size. In the end I couldn't figure the exact logic behind it and I had to resort to randomly experimenting until it worked. 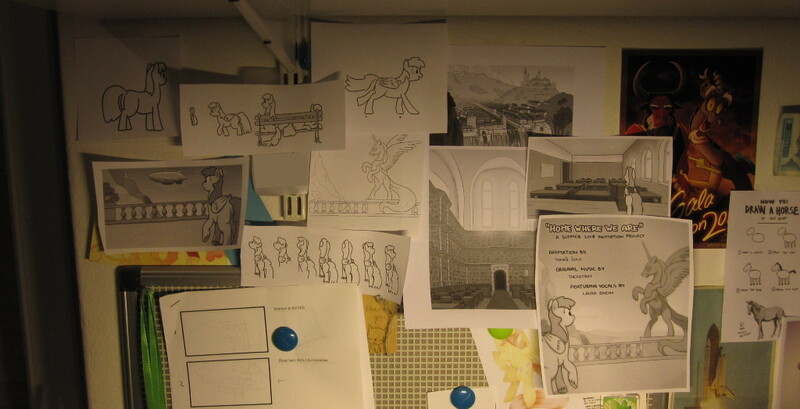 Having separate, simpler project files for each scene helped this significantly. Frame scaled explicitly from 1080p to 720p using Composite & Transform (left) and scaled implicitly during rendering (right). Another thing I noticed was the the implicit scaling of video tracks seemed to use lower-quality scaling algorithm than the Composite & Transform, resulting in annoying visible changes in image quality. In the end, I forcibly scaled all tracks to 720p using an extra Composite & Transform, even when one was not explicitly necessary. 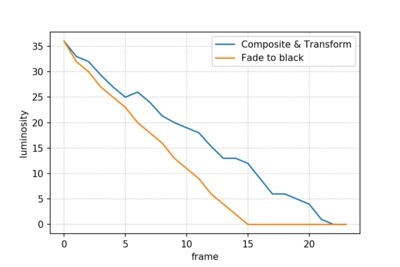 Comparison of luminosity during a one second transition from a dark scene to black between Fade to black effect and Composite & Transform transition. 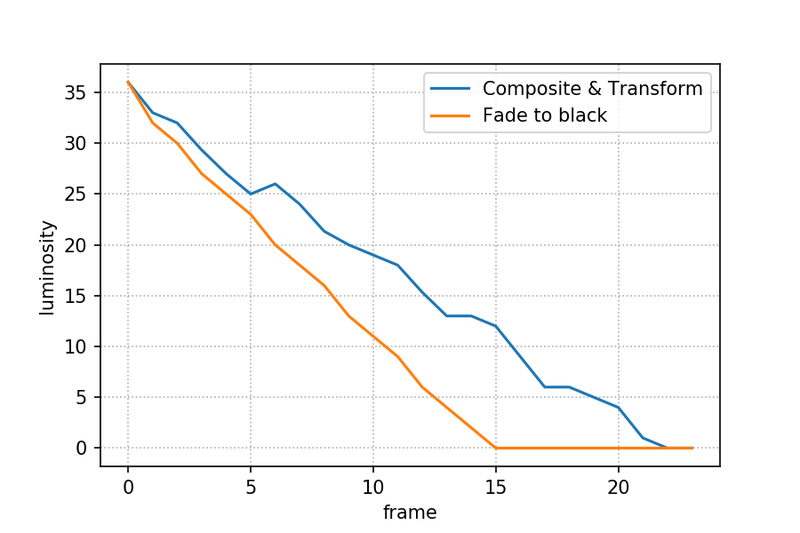 Fade to black reaches black faster than it should, but luminosity does not jump up and down. I was initially doing transitions between scenes using the Composite & Transform because I found adjusting the alpha values through keyframes more convenient than setting lengths of Fade to/from black effects. However I noticed that the Composite & Transform seems to have some kind of a rounding issue and transitions using it were showing a lot of bands and flickering in the final render. In the end I switched to using Dissolves and Fade to/from black which looked better. Finally, some minor details about video encoding I learned. The H.264 quality setting in Kdenlive (CRF) is inverted. Lower values mean higher quality. H.264 uses YUV color space, while my drawings were in RGB color space. 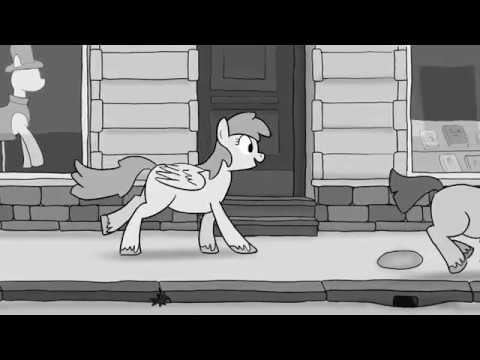 After rendering the final video some shades of gray got a bit of a green tint, which was due to the color space conversion in Kdenlive. As far as I know there is no way to help with that. GIMP and PNG only support RGB. In any case, that was quite minor and I was assured that I only saw it since I was starting at these drawings for so long. How to sum this up? Almost every artist I talked with recommended using proprietary animation software and was surprised when I told them what I'm using. I think in general that is reasonable advice (although the prices of such software seem anything but reasonable for a summer project). 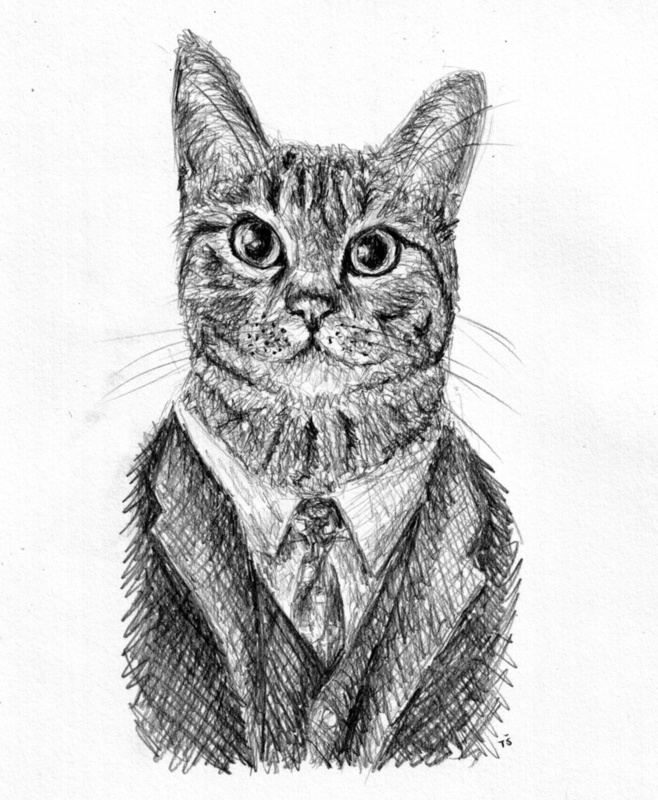 I was happy to spend some evenings writing code and learning GIMP internals instead of drawing, but I'm pretty sure that's more an exception than the rule. Recently I was debugging an unusual problem with the PulseAudio daemon. PulseAudio handles high-level details of audio recording, playback and processing. These days it is used by default in many desktop Linux distributions. The problem I was investigating was on an embedded device using Linux kernel 4.9. I relatively quickly I found a way to reproduce it. However finding the actual cause was surprisingly difficult and led me into the kernel source and learning about the real-time scheduler. I thought I might share this story in case someone else finds themselves in a similar situation. This triggers 100 playbacks of the foo.wav file at almost the same instant and would reliably make the daemon restart on the device. However I was sometimes seeing restarts with less than ten simultaneous audio plays. A similar script with 1000 plays would sometimes also cause a restart on my Intel-based laptop using the same PulseAudio version. This made it easier to investigate the problem since I didn't need to do the debugging remotely on the device. systemd: pulseaudio.service: Unit entered failed state. systemd: pulseaudio.service: Failed with result 'signal'. However, there were no other clues as to what sent the SIGKILL or why. Kernel log from dmesg had nothing whatsoever related to this. 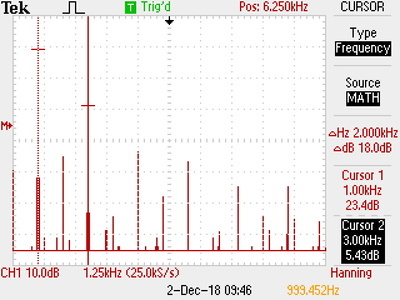 Increasing logging verbosity in systemd and PulseAudio showed nothing relevant. Attaching a debugger and strace to the PulseAudio process showed that the signal was received at seemingly random points in the execution of the daemon. This showed that the problem was not directly related to any specific line of code, but otherwise led me nowhere. When I searched the web, all suggestions seemed to point to the kernel killing the process due to an out-of-memory condition. The kernel being the cause of the signal seemed reasonable, however OOM condition is usually clearly logged. Another guess was that systemd itself was killing the process after I learned about its resource control feature. This turned out to be a dead end as well. 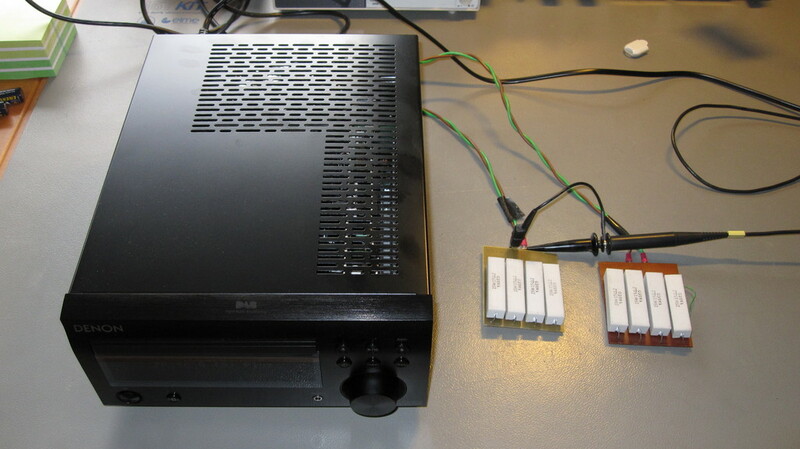 alsa-sink-ALC32 is the thread in the PulseAudio daemon that is handling the interface between the daemon and the ALSA driver for the audio hardware. The stack trace shows that the signal was generated in the context of that thread, however the originating code was called from a timer interrupt, not a syscall. Specifically, the run_posix_cpu_timers function seemed to be the culprit. This was consistent with the random debugger results I saw before, since interrupts were not in sync with the code running in the thread. Now things started to make sense. Linux kernel implements some limits on how much time a thread with real-time scheduling priority can use before cooperatively yielding the CPU to other threads and processes (via a blocking syscall for instance). 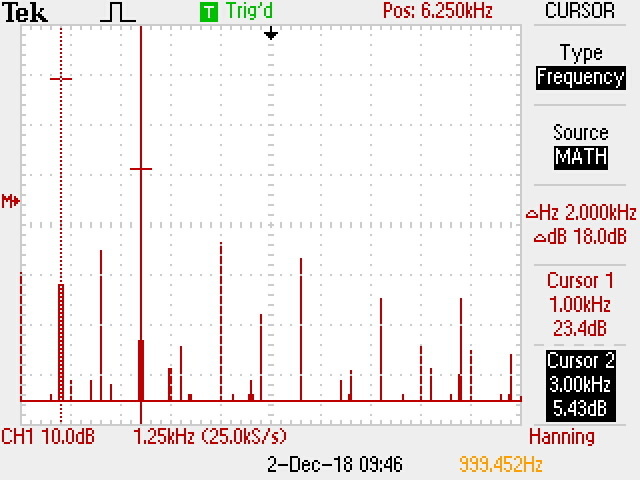 If a thread hits this time limit it is silently sent the SIGKILL signal by the kernel. Kernel resource limits are documented in the setrlimit man page (the relevant limit here is RLIMIT_RTTIME). 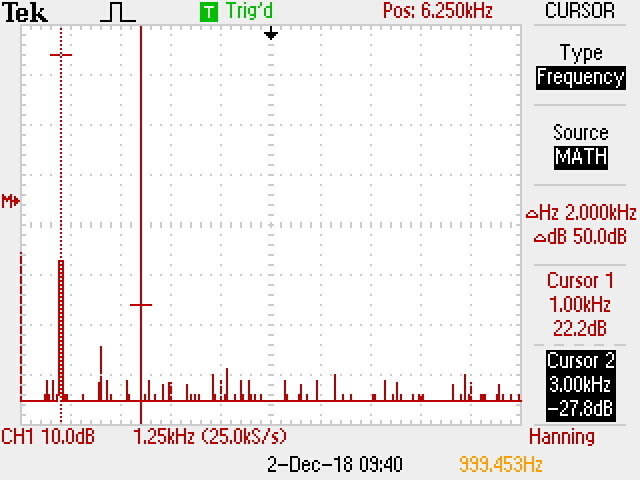 The PulseAudio daemon was setting the ALSA thread to real-time priority and it was getting killed under load. It would be really nice if kernel would log somewhere the reason for this signal, like it does with OOM. It might be that in this particular case developers wanted to avoid calling possibly expensive logging functions from interrupt context. On the other hand, it seems that kernel by default doesn't log any process kills at all due to resource limit over-runs. Failed syscalls can be logged using auditd, but that wouldn't help here as no syscalls actually failed. accept the fact that PulseAudio will restart occasionally and make other software on the device recover from this case as best as possible. After considering implications to the functionality of the device I went with the last one in the end. I also slightly increased the default RTTIME limit so that restarts would be less common while still having an acceptable maximum response time for other processes.